As good as the story for Escape from Eden was, it was the characters that made it for me. Mia, who has lived in Edenton since she was 10 years old, is so well written. Mia grew up in this cult and is questioning the things she’s been told to believe. She’s different from the others around her and that’s starting to make a tangible difference in what she wants in life. What I loved most though, was that Elisa Nader recognized that someone who’d grown up with that level of brainwashing would have a bit of an internal struggle to overcome. Mia is strong and she knows right from wrong – and she’s struggling to make the right decisions for herself with that knowledge. But there’s a certain amount of fear that come from growing up in a cult, not to mention love and concern for her mother, brother, and other friends. She’s also dealing with new, unfamiliar feelings. All this combines to make a beautiful complex character, who grows throughout Escape from Eden. As things are revealed to her Mia gets stronger and morphs from someone who seemed timid and uncertain to a brave, strong, independent young woman. I couldn’t help but love her. Gabriel, whose family has just joined Edenton, stirs something in Mia that she’s never felt before. A part of this is that Gabriel is more like Mia than she knows. Having just come in from the outside world – and not willingly, but forced by his family – he’s not “drinking the kool-aid.” This makes Gabriel both dangerous and oh-so appealing to Mia. And he recognizes something in her, that she is different, and thus is drawn to her. He’s also a complex character, with may layers that reveal themselves slowly throughout the book, as he too grows and changes. Mia and Gabriel develop a relationship that depends so much on their desire to be free and is complicated by confusing romantic encounters. I loved the way Nader wrote their relationship – it was so incredibly believable. There is no insta-love here. Instead you have two teenagers, thrown into a very intense situation and they grow close as a result. But Mia is so confused by what their relationship; she doesn’t know how to read the signals he’s sending and that makes her doubt and suppress her own potential feelings. The supporting characters are also really well written. I loved that Nader was able to so convincingly show characters, entirely through Mia’s eyes, in so many different stages of belief and disbelief. You’ve got characters that believe thoroughly and could never be convinced otherwise. You have some who are scared not to believe. You have others who are wrestling with accepting truths that they don’t want to believe and others who’ve always been aware. It’s incredibly well done and believable. As a character driven reader, these characters really pulled me in and wouldn’t let me go. 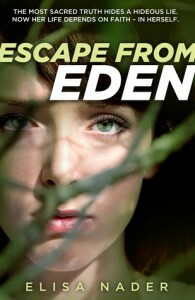 Escape from Eden is set within a remote jungle in South America where a cult – Edenton – has been established as its own little Garden of Eden, supposedly protecting its members from the outside world. There’s so much more to this cult than religious manipulation though and the secrets are pushing in on you from the very start. I quickly formed opinions and suspicions about many aspects – and was pleasantly surprised that I was often wrong. There were some predictable moments, but there was enough going on that I don’t think anyone could solve every mystery or call of twist or turn. Nader certainly keeps you on your toes! Some of the shocking moments were truly appalling and worked really well to move the story forward, all while twisting your gut, or if you’re like me – making you throw things (thankfully not my eReader!). There was one moment in particular that really got to me, but later didn’t seem to fit the story and I kept waiting to see the incongruities work themselves out. They didn’t – and perhaps I was over-thinking things – but it wasn’t enough to make me dislike the story. Nader did a really fantastic job of shocking the hell out of me at times and making me invested in the characters throughout. I enjoyed the twists and turns and was emotionally invested – a distressed – throughout. I definitely recommend for a good young adult dystopian read.